As the 2015 ASB Youth League enters its final stretch, up to seven teams are still in with a shout of claiming the title, and WaiBOP United is right in the thick of it. We currently sit in fourth, two points behind Team Wellington and Waitakere United and one behind Sunday’s visitors, Canterbury United. That means Sunday’s match, which has been transferred to Hamilton’s Porritt Stadium (from St Peter’s School, Cambridge) is make or break for both sides. Both teams enter the match on the back of excellent, if contrasting results. Canterbury thumped fifth placed Southern United 5-0 last weekend to move above their southern neighbours, while our young lads survived all manner of travel nightmares to claim an injury time winner in a 3-2 victory at Heartland Wairarapa. 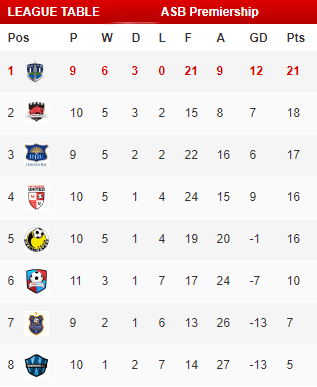 A win will ensure we keep pace at the top of an extremely tight 2015 ASB Youth League table. “I love a good football cliché, but there’s no doubt this is a cup final for us, one of three we have left this season,” said Built. “It’s a great opportunity to see how the players have improved over the course of the summer. Can we put in a performance and get a result against one of the big boys when it really matters? Can we handle the pressure? It’s an exciting test for me, as a young coach, and this talented playing group. Click here for the match day magazine for WaiBOP United versus Canterbury United. Click here for the current ASB Youth League standings. Waikato BOP Football is a football club from New Zealand. On this website, we post news and updates from the Waikato Junior Football league as well as the senior league. Moreover, we will also keep you updated on general New Zealand football news. You can also find a huge selection of articles on BOP football and match results. We also like to speculate on who is going to win, so there is also a lot of posts about future matches. Be sure to support this community on social media, and do not be shy to get in contact with us. We wish to create a place where everyone feels welcome to discuss about WaiBOP football and soccer in general here. So welcome to WaiBOPUnited, and we hope you enjoy your stay. A game of football is played according to internationally agreed rules, also known as the laws of the game. There are two teams, each consisting of 11 players, that compete against each other to get the ball in the other team’s goal, which counts as one point or goal. The standard for the ball that is used for the game is usually 68-70 cm in circumference. At the end of the game, the team that scored more goals is the winner of the match. If the number of goals is equal, then the game is considered a draw. One of the main rules of the game is that the players may not touch the ball with their arms and hands, except the goalkeeper. The players may use other body parts though, usually the forehead. During normal play, the players are allowed to move the ball in any direction on the field except they may not pass to players who are in offside. The attacking team’s objective is to score a goal. The players can go about this controlling the ball and where it goes, by passing it to a teammate, dribbling and taking shots at the opposite’s team goal, which is guarded by that team’s goalkeeper. On the other side, the players from the second team may try to gain control of the ball from their opponents by intercepting an attempted pass or through directly taking the ball from the player. All of this should be done without players making physical contact with each other.